Born and raised in Malaysia, Woo Ming Jin left for the United States at the age of 19 to pursue an undergraduate degree in business and, subsequently, a master degree in film production. 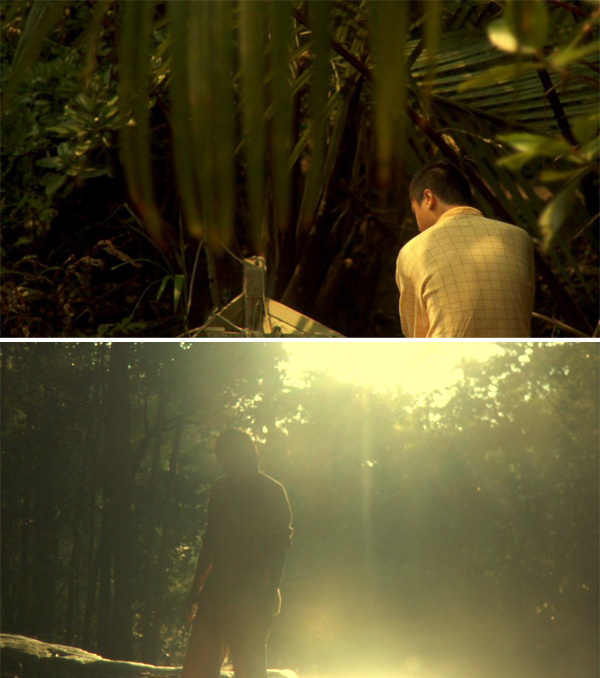 Upon his return to Malaysia, Woo started out as a director of photography for Amir Muhammad’s The Big Durian (2003). He went on to make the Muhammad-produced Monday Morning Glory (2005), which screened at Berlin, Locarno, Pusan and Tokyo. Since then, he has written and directed five more feature-length films: The Elephant and the Sea (awarded Jury Special Prize at the Torino International Festival of Young Cinema, 2007), Days of the Turquoise Sky (awarded Special Jury Prize at the Bangkok International Film Festival, 2008), Woman on Fire Looks for Water (selected to the Venice Film Festival, 2009), The Tiger Factory (selected to Directors’ Fortnight, 2010) and Seru (2011). In 2009, my jury colleagues and I had the privilege of giving a special mention to Woman on Fire Looks for Water at the Cinemanila International Film Festival . Set in a quiet fishing village, the film is about a father (Ah Kau) and his son (Ah Fei) who try to reconcile their feelings of love and regret with their respective lovers. I have chosen to highlight a series of images in the film that do not necessarily appear next to each other. 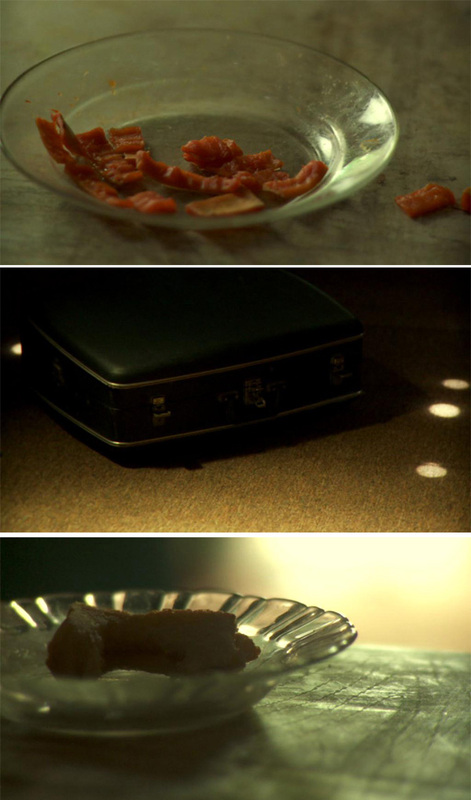 Like the characters in the film, these images are similar and speak to each other, but are separated by the filmmaker. In the following interview, Woo and I will discuss these images. Tan Bee Thiam (BT): Let us start with the first and last shot of the film. The film opens with the back of Ah Fei. He is by the side of his dad who thinks he is dying. The film ends with Ah Fei silhouetted against a sunset sky. He is by the side of Lily, his first love. It is unclear if she is alive. Woo Ming Jin (MJ): The first scene is something I added on a few months after the shoot. I wanted to tell the story of the father and son a little more, so I wanted more shots of them. For this shot, we ventured into the mangrove area, and found some boats. Some were old decrepit boats, left to rot, while others were presumably just waiting to be taken out to sea. It was early morning and the sounds of insects along with the dense greenery provided an eerie yet beautiful frame. The last scene was shot at a waterfall in Ulu Yam. I had wanted the picture to be washed out and hazy. We waited until that right moment sometime around 6pm or so, and then got this shot. The water reflected the sunlight so it seemed as though light was coming from the top and also from below. It felt right. BT: I am curious about the images between your scenes. Tell us why you put them in. MJ: I shot a lot of cutaways for this film. I’m not sure how many but I believe it was around a hundred shots. We used them all, or almost all. The story could be told not just from the characters but also the environment they were in. This is a fishing village, and the people used the river and sea for subsistence, and so I saw some sort of “collision” between what is nature and man-made. A better word may be “amalgamation,” but I think “collision” describes it just fine. BT: There are a few images that are repeated in the film. 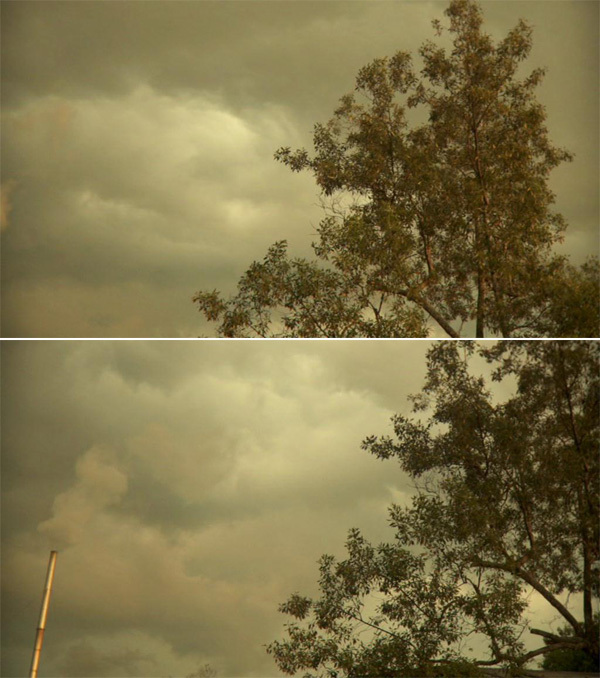 For example, there is this image of the same tree against the grey skies, framed slightly differently to reveal the factory chimney when it was used the second time. MJ: Well it’s the same with the point above. I wanted to tell a sort of story with its setting firmly in place. The image slowly reveal small hidden stories – a factory chimney churning smoke next to a swaying tree. Little crabs dancing in the mud, old rusted nets, a newly carved oar. BT: This image of the flowers is used twice too. In the second time it is used, there is an additional close-up. MJ: I don’t know what flowers these are. But they came from a tree at the salted fish factory, and I felt they were quite pretty. 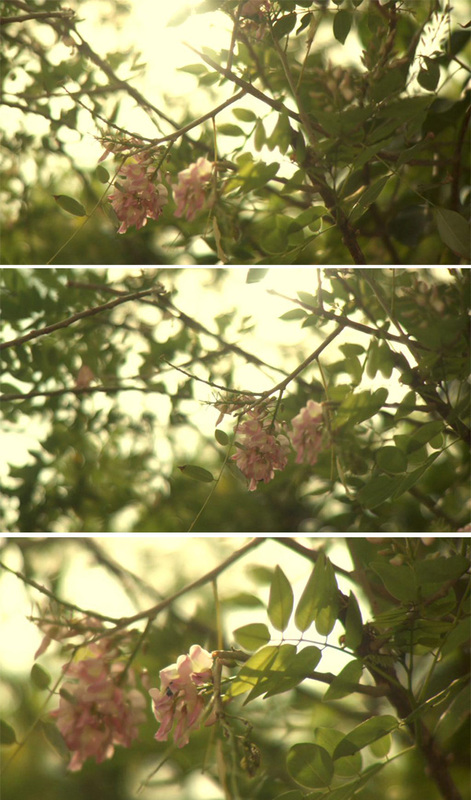 I’d seen some pictures of flowers that Rinko Kawauchi had done, and I wanted to do the same! BT: The same images of flora and fauna are used towards the end of the film. What is the role of nature in the film? MJ: Well I think all my films deal with nature in some ways. The trees, the river, and the birds are all characters in the film too. I’m quite an outdoor-sy kind of person. I like hanging out by the beach and jumping into waterfalls. I mostly shoot in places I enjoy going to. 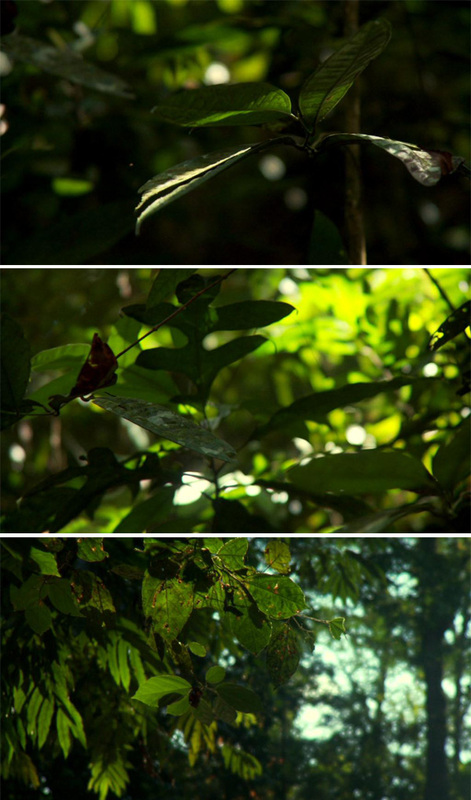 These shots were in Ulu Yam. I come here occasionally to dip into the waterfall, and to get some “magic water” into my system. I find it is quite therapeutic just being in the water. I haven’t been back for a year or so now, but it’s just a great place. In this film, there is an element of magical realism, so this location is definitely fitting! 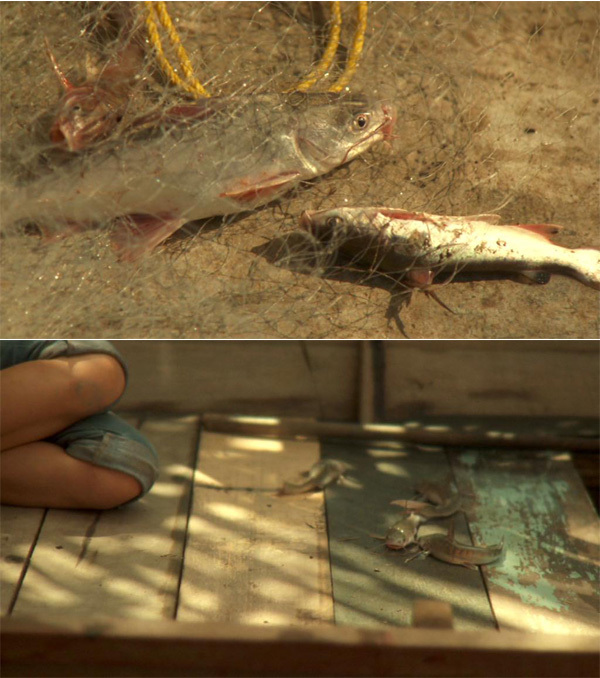 BT: Another image that is repeated a few times is that of the fishes that are caught in the net. Another one that stuck out to me is that of live fish jumping on the boat beside Lily. It is unclear if she had caught them, and yet she does not release them back into the river. They are left to die. MJ: This particular kind of fish is abundant in the river. The locals view them as a sort of nuisance, since they are boney and almost inedible. The bigger ones are used as salted fish, while the smaller ones are thrown away. I liked the closeups of the fish because I felt they conveyed a sense of desolation, a fate that is certain, which is death. The gaping mouth, gasping at air that cannot aid them is a powerful and strong image to me, as is one of them flopping about on the boat. 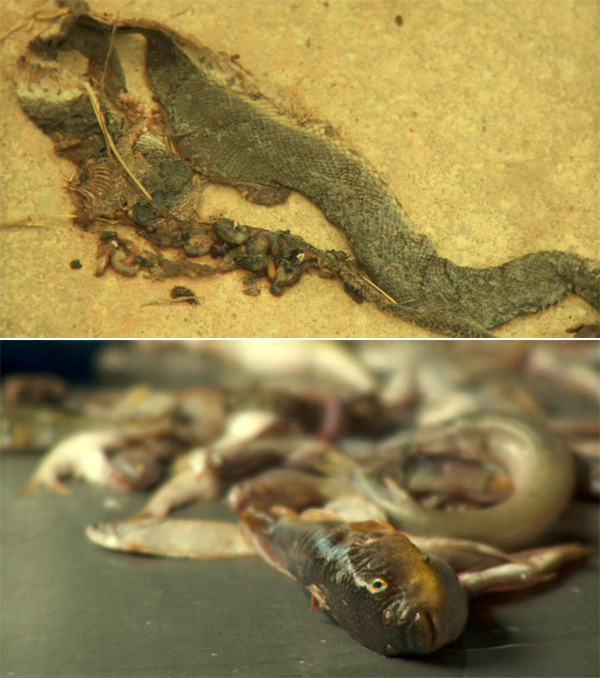 BT: Speaking of animals, I remember this image of a snake, trampled with its organs splattered. It isn’t part of a harvest, unlike the fishes and eels in the factory. MJ: We just found this near the house we were shooting in and decided to use it. Flies were swarming the carcass, so we filmed it. I didn’t think much of it while I was shooting it, but ended up using it in the film. BT: These images remind me of Rinko Kawachi. Why was Kawauchi used as a reference? MJ: I like her photography very much, in the sense that she shoots everyday life, like me. She also likes to use subjects close to her (family, etc. ), and shoots with natural light. Her images are very dreamlike, but not in a Disney fantasy kind of way, just the opposite. Harsh reality in a dream-like brush stroke, I would say. My film deals with the same themes, and since I liked her pictures so much, I thought I’d do a sort of homage, which is why I shot a lot of still cutaways. BT: You usually follow images of trees with images of factory chimneys. Again, this image is used a few times, including once in the early morning when Su Lin sets off for the jetty. Ah Kan is not there. Ah Fei and Ah Kan set up expectations of their lovers (both Lily and Su Lin), but let them down in the end. MJ: I just liked this picture very much. 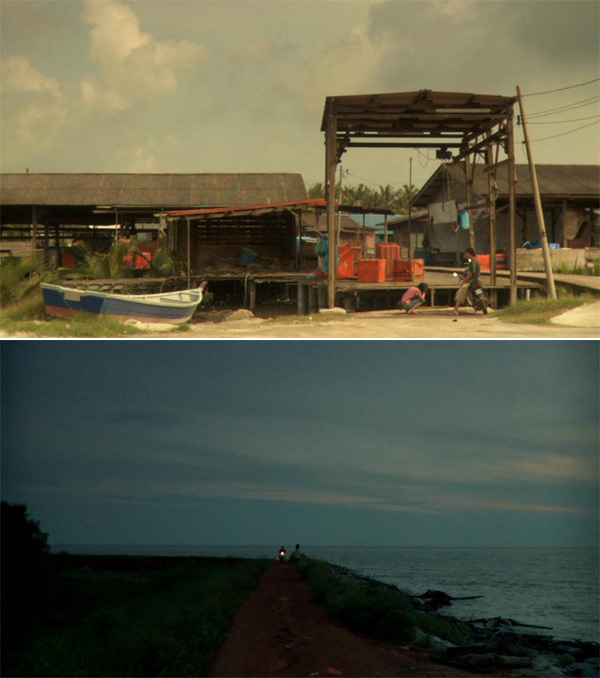 It’s where the salted factory is, and also close to the pier where Su Ling goes to meet Ah Kan. The smoke reminds us that even in darkness, life goes on. BT: You use a very long shot for the climactic scene when Lily confronts Ah Fei. That is repeated in an even longer shot in the evening. MJ: In retrospect, I slightly regret not pushing the camera closer, but at the time I felt the frame that the actors were in conveyed a lot of the emotions they felt, particular for Fei Ling’s character. Life will go on without them, I suppose. They are just a tiny part of the equation. BT: What are you working on currently? MJ: Working on several small projects, short films, and also preparing a big commercial film. I like to mix it up. Well, in a sense I have to, since I have to pay some bills. But the project that I’m most excited about is the film I am making about my daughter. It is an epic film and I will be shooting it for three years. It either becomes an epic home video, or something better! Days of the Turquoise Sky . By Ming Jin Woo. Dir. Ming Jin Woo. Perf. Mislina Mustaffa, Namron and Carmen Soo. Prods. Ming Jin Woo and Edmund Yeo. 2008. Monday Morning Glory . By Ming Jin Woo. Dir. Ming Jin Woo. Perf. Azman Hassan and Sharaad Kuttan. Prod. Amir Muhammad. 2005. The Big Durian. By Amir Muhammad. Dir. Amir Muhammad. Perf. Amir Muhammad, Ghafir Akbar and Boon Tat Soh. Prod. James Lee. 2003. The Elephant and the Sea. By Ming Jin Woo. Dir. Ming Jin Woo. Perf. Berg Lee, et al. Prods. Ming Jin Woo and Ueda Tomoko. 2007. The Tiger Factory. By Ming Jin Woo and Edmund Yeo. Dir. Ming Jin Woo. Perf. Fooi Mun Lai, Pearlly Chua and Susan Lee. Prods. Ming Jin Woo, Edmund Yeo and Ando Kohei. 2010. Woman on Fire Looks for Water. By Ming Jin Woo. Dir. Ming Jin Woo. Perf. Ernest Chong, et al. Prod. Edmund Yeo. 2009.